First modern boxing gloves are made by Jack Broughton. Actually, lots of materials which are used to do these boxing gloves and this pair was only used for teaching self-defense and sparring and you can see Guardian’s post for more details about it. However, boxing gloves have been used for punching bag sessions, double end bag and focus mitts drills… for a really long time. There are also people who use gloves in speed bag sessions. Back then there weren’t lots of cover material types however nowadays these pairs have many different cover material types. Let’s start “What are Boxing Gloves Made of” subject with it and continue with the padding. Also, I am sure that you will find padding type section particularly interesting. There are genuine leather, synthetic leather, and vinyl type cover materials. Genuine leather is the most durable and gloves, which are made of genuine leather, generally, provide longest durability periods. Some examples are goatskin, cowhide, and “Nappa”. And in my experience goat skin tends to last a lot longer and you can find some very quality training gloves which are made of goatskin leather. With that, these generally do not have rough spots around 3-4 years. Cowhide leather also has good quality yet it is not durable as goatskin and lots of companies use it for heavy bag gloves. These are incredible for punching bag sessions and everyone (company and customers) seems to be happy with the performance and the durability of it. This trend has been continuing for a decade and in my experience cowhide skin leather is just perfect for heavy bag gloves, too. As you can guess, genuine leather is way more expensive than synthetic leather. With that synthetic leather is easier to process and stitch etc. These stitches are made with nylon thread. And there is also vinyl which is the worst material for a pair of boxing gloves. These last around 4-5 months and after this period, it will start having rough spots or tearing apart very soon. I also had vinyl pairs which became useless just after a couple of sessions. Seriously these are not worth your money. 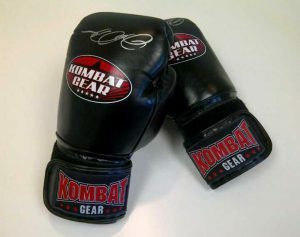 Padding of the gloves is generally made of foam and this is made of either polyurethane or latex. However, latex padding is used less and less these days. Because this padding type loses its quality relatively sooner than polyurethane. Also sometimes companies produce pairs with layers of padding. They basically glue the padding to another padding. And this padding type can be found in lots of sparring gloves. Lately, some companies like RDX started using injected padding and this is basically the same material (polyurethane) which is blended with some other chemicals. When it is injected into a glove, it provides “natural” distribution. With that, Winning has been using horse hair. Yes, you read it right 😉 And the padding has top-notch quality. Also, horsehair generally gets rid of moisture better than any other padding type. I can also say that this company produces amazing quality handmade boxing gloves. If you are interested, you can check out the review of Winning Gloves for more information. High-density cotton had been used as “foam” for a really long time, however, I have not seen a pair which has cotton as padding for a long time. There is an actually very interesting fact. Lots of knock out artists generally prefer horse hair padding over polyurethane or latex foam for decades. With that, companies generally play with the ratio of polyurethane foam to do different glove types. In that way, these companies can produce more suitable gloves for sparring, heavy bag, pad work etc. 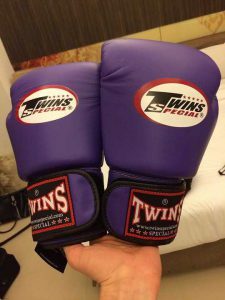 Also if the pair has attached thumb, which is generally found in training and sparring gloves, gloves have a strip of cover material (vinyl, leather…) to hold it. These are all I know and researched about “what are boxing gloves made of” subject. There are lots of materials which are used for the cover of gloves. Some have perfect quality like goatskin leather and some don’t even have the slightest quality like vinyl. And there are also many padding types. Some companies (Hayabusa) use the latest technology whereas some companies use materials like horse hair. If you are interested in knowing more about these gloves’ materials, definitely check out this article. You can find way more information in that article. I tried covering everything in this writing however if you have anything to add, ask or share, just have a comment below. Sounds like to have good quality then you need to go with leather. I suppose that these kinds do cost more than the lesser quality kinds? How much more do the leather ones cost than synthetic leather and the vinyl ones? You are 99% right 🙂 But sometimes synthetic leather gloves have amazing quality like Hayabusa pairs. And the price can actually change according to lots of variables and if you want to know more you can have a look at here. Thank you for your article. I was about to purchase a pair of gloves but I didn’t know what type of materials I should be looking for. Can you tell me the average price for a pair of genuine leathers? Thank you! Well pricing can change a lot and if you look for genuine leather you will probably need to spend more than $70. And if you look “how much do boxing gloves cost” post, it will give you more information about it. Interesting article about the material of boxing gloves. As like any other products, it seems that genuine leather is one of the materials durable and work well. As mass production started there are so many things made of chemical fiber. I would like to buy something real and have quality over quantity if I can afford. I totally agree with you and this is why Grant, Winning and many other companies still produce handmade gloves.